Mai Chau is located about 160km from Hanoi. The valley offers stunning sceneries with emerald green mountains & paddy fields, and distinctive cultures of ethnic minority. 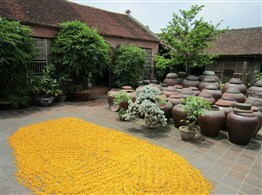 The next destination is Moon Garden – the best homestay in Vietnam. You can immerse yourself in the peaceful atmosphere in the outskirt of Hanoi and participate in many interesting activities to get a deeper perception of Vietnamese rural life. This trip offers amazing opportunities to visit countryside areas and discover daily life of local people. You take a first visit to Mai Chau Valley - home of Thai Ethnic minority with unique lifestyle. Then stay at Moon Garden Homestay - one of the best homestays in Vietnam, visit to nearby villages, explore local daily life and experience local activities. This morning, our private guide and driver will pick you at your hotel and depart for Mai Chau. We drive on a beautiful and hilly road to Mai Chau. On half way, Optional, stop for visiting Hoa Binh Hydro Power Station – The biggest power station in Vietnam. You will arrive at Mai Chau around noon. Have lunch and relax. In the afternoon, we will go trekking for 2 hours to visit Lac & Poom Coong villages here you will have chance to see “Tho Cam” - a unique product of Thai people. See the houses on stilts and sink deep in Thai’s customs by enjoying a traditional music show and taste “Ruou Can” – special local wine. Overnight in the home of Thai hill tribe (Ban Lac village). Mai Chau, the heart of a beautiful valley that is a world away from the hustle and bustle of Hanoi. The modern village is an unappealing sprawl, but as you emerge on the rice fields and rural living it is transformed into a real paradise. It’s a stunning area and a great Vietnam Tour to do!!! Free exploration of Ban Lac village. After lunch, drive to Ky Son (Moon Garden Homestay). Arrive at the lodge "Moon Garden" in Ky Son village in the afternoon. A local drink will be available in welcome. Free time to explore the Country and the village Ky Son. Meanwhile perfumed water for the shower, you can drink and eat local products such as sweet potatoes or corn, peanut, cassava ... offered by the owner of the house depending on the season. 18h00: Traditional herbal bath scented (lemon, grapefruit leaves and Huong Nhu). 20.30: Observing the special worship of the Buddha and "Spa" Foot: The feet soaked in hot water with ginger, salt and herbs Ngai Cuu before bedtime. 7:30: Breakfast, then you will participate in the ceremony of burning votive papers for the dead. 8:30: Bike rides with local guide through the paths of the campaign Thac Thang village to discover the tomb of King Ngo Quyen, the temple of King Phung Hung, the ancient village of Duong Lam Pagoda and Mia. Back home. 11h00: You are participating in cooking classes. 13h30: "Spa" of the hand (you dip your fingers in a scented water for a little massage of the hand). Free time to relax on the hammocks in the garden, take pictures with traditional dress, or walk around freely in contact with people until you Say goodbye. 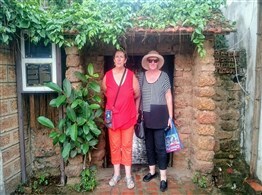 Back to Hanoi with visit to famous Duong Lam ancient village and Mia Pagoda. Arrive in Hanoi at around 16:00. End of an beautiful Vietnam tour.